Holds grids during filming; allows coating underneath, hole size 2.4mm. The PELCO® TEM grid holder blocks are designed to hold a number of TEM grids when they need to cleaned in a glow discharge system such as the PELCO® easiGlow system or if they need to be coated in a carbon coater such as the Cressington 208C high vacuum carbon coater. The TEM grid holder blocks are made of a solid piece of vacuum grade aluminum and have recessed positions for each grid with slots for easy loading and lifting the grids with fine pointed tweezers. Each position also has an additional centre recess to avoid any contact with the grid support area and the block. Handling of TEM grids with these blocks is much easier and more secure than using glass slides. 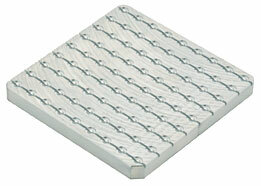 The PELCO® TEM grid holder blocks are available in two sizes: 25 grids and 81 grids. The larger size is ideal for use coating system with a larger chamber or with rotary-tilting stages.